Last week both Frances Padilla and I attended the annual Families USA conference, Health Action 2014. We heard an inspiring keynote speech by Vice President Joe Biden on how the Affordable Care Act (ACA) has brought health coverage and peace of mind to millions of Americans. And we attended great workshops and had the opportunity to meet and talk with an amazing array of dedicated health reform advocates from across the country. A highlight of the meeting for me was the first-ever meeting of the Blue State Caucus. A Red State Caucus has been meeting in person and via teleconference for several years, allowing advocates from states where opposition to health reform is strong to share strategies to help each other make progress. The states in this group have benefited greatly from sharing strategies on several issues, including efforts to pass legislation to set up state-based or partnership exchanges, conducting outreach and enrollment and expanding Medicaid. The goal of the Blue State Caucus meeting was to show that there is value in the blue states working more closely together, too. Who are the blue states? These are the states that are embracing the ACA, using the policies and the funding to expand coverage for as many of their residents as possible and improve the health of their people. Mapping out the blue states starts with looking at which states are running their own exchanges, rather than asking the federal government to be in charge. 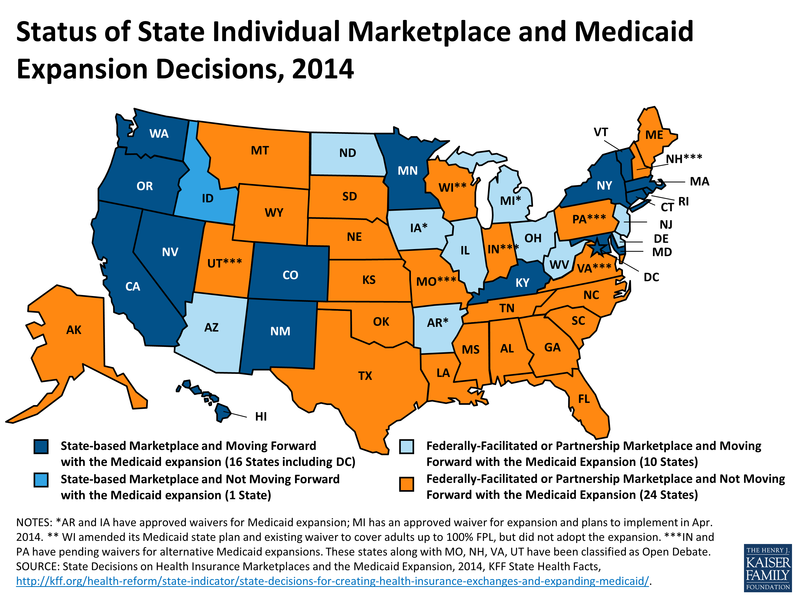 Which states have expanded Medicaid is also an important measure. Overlaying these two criteria together, starts to give a picture of who the blue states are. With a few exceptions, most of these states are located in the northeast or on the west coast. Many of them have a long history of expanding coverage when they can. But there are also many economic, demographic, political and cultural differences between these states, leading to variations in how health reform is rolling out in each of them. 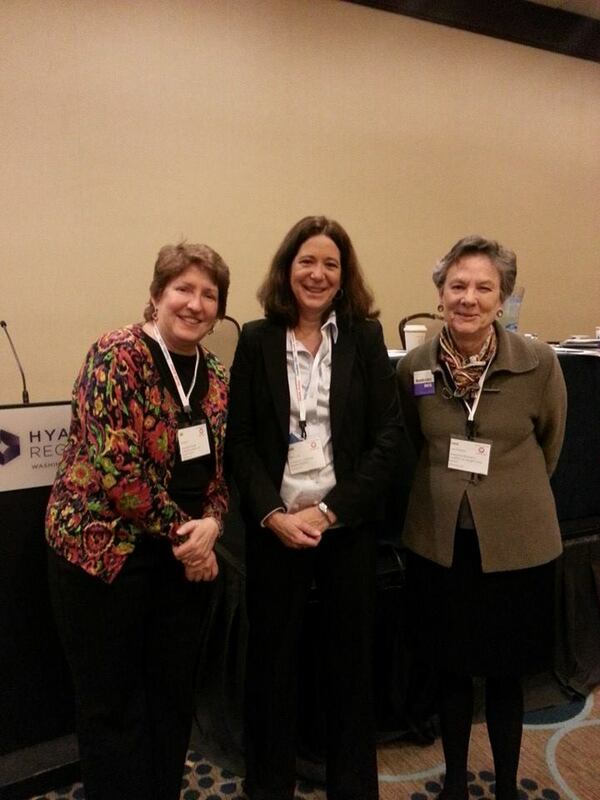 From left to right Jill Zorn, Universal Health Care Foundation of Connecticut; Debra Judy, Colorado Consumer Health Initiative, and Leni Preston, Maryland Women’s Coalition for Health Reform. About 50 people gathered at the Blue State Caucus for a lively discussion, facilitated by Debra Judy of the Colorado Consumer Health Initiative, Leni Preston of Maryland Women’s Coalition for Health Reform and me. Advocates in the room identified the areas where their states are concentrating their health reform efforts; focusing on: access to coverage, access to care and health system transformation. We also discussed possible next steps for the caucus, agreeing that it is important for blue states to keep talking with each other. Even though the ACA is a federal law, there is huge variation in results between those states that are really trying to implement the law and those who are doing everything they can to undermine it. The states that are cooperating with the law are serving as laboratories, testing out what works and what doesn’t. If the leader states can share best practices and strategies, they can help the entire country-both blue and red states-move more quickly and intentionally toward the ultimate goal of achieving access to quality affordable health care and better health for everyone. Universal Health Care Foundation will be doing what we can, working with national and state-based advocates, to move the Blue State Caucus forward.